Taking readers into the heart of Cambodian culture with this compelling litany of triumphs and terrors, poet Oeur (Sacred Vows) recalls his life as an adroit survivor. Growing up with his farming family in the Cambodian countryside, he had a bucolic boyhood, herding water buffalo away from rice paddies, before a 1961 scholarship took him to California State University. He attended the Iowa Writers’ Workshop amid the 1960s unrest: "All the tumult that seemed to be tearing America apart, looked like real democracy in action to me." Back in Cambodia in 1968, he married, was elected to the Khmer Republic’s National Assembly and became a delegate to the U.N. After Pol Pot’s Khmer Rouge caused Cambodia to become a "synonym for insanity," in 1975, millions died from diseases, starvation and execution (the three titular wildernesses). Although Oeur evaded the "killing fields" by feigning illiteracy in six forced-labor camps, there were 23 deaths in his family during the Pol Pot regime. He returned to the U.S. in 1992 and now lives in Texas. This sensitive summary of his nomadic life resonates with passion, poignancy and self-insight. 8 b&w photos not seen by PW. This remarkable story of survival features Oeur (Sacred Vows), an American-educated Cambodian poet who survived the Khmer Rouge era by changing his name, feigning illiteracy, and depending on his peasant skills. Oeur tells of how he grew up on a Cambodian farm watching over the family water buffalo, pursued his studies in the United States, and acquired a position as a UN delegate. But his story turns dark as he relays how in 1975, Pol Pot’s Khmer Rouge took over and forced Oeur, his son, wife, and mother-in-law into a series of labor camps, where they faced the three wildernesses-death by execution, death by disease, and death by starvation. Fortunately, they survived, but Oeur’s twin newborn daughters did not. Oeur describes the improved conditions when the Vietnamese took over in 1979, though as a writer he was always under suspicion. Eventually, in 1991, his friends were able to bring him to America. Published on the 30th anniversary of Pol Pot’s takeover, this memoir serves as a testament to Oeur’s courage and inspiration and brings a compelling, first-person perspective to the hellish years of the Cambodian genocide that left 1.5 million dead. Recommended for all libraries. Cambodia, U Sam Oeur explains, is a land of dreams and spirits, haunted by its history. His autobiography preserves 70 years of his country’s turbulent history, from the days of French colonialism through the horror of the Khmer Rouge, and gives a colorful depiction of a culture that was almost destroyed by the regime of Pol Pot. U Sam Oeur’s life is extraordinary, if not mythic. Born a farmer’s son in 1936, he began his education as a naked schoolboy in a country village, and finished with a Master of Fine Arts in creative writing from the University of Iowa. After living in the US for seven years, he returned to Cambodia in 1968, married his fiancée who had waited for him to come home, and put his poetry aside to become a successful businessman and politician. He served as a delegate to the UN months before the Khmer Rouge entered Phnom Penh and the horror of the Pol Pot years began. This is one of the few accounts written by an adult survivor of that era, and it is an amazing document, filled with the details of daily living, punctuated by the "three wildernesses" of disease, starvation, and execution. "Living as a cipher," erasing his past, drawing on his rural background to keep himself, his wife, and his son alive, U Sam Oeur credits their survival to the advice and protection of guardian spirits who have been a vivid presence in his life. 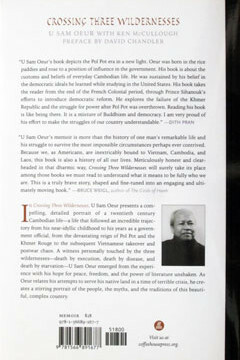 After the Vietnamese invasion toppled the regime of the Khmer Rouge and U Sam Oeur was able to return with his family to his house in Phnom Penh, all that remained of his former life was a page torn from a volume of Emily Dickinson. "The survival of that page seemed miraculous at the time," and he keeps this with his own poetry, in Texas, where he now lives, writes, and translates Walt Whitman into Khmer. The beauty of this book lies in its detail and its candor: the meticulous description of a small community of rice farmers showing what Cambodia lost during the close of the last century; the horrifying story of the Khmer Rouge evacuation of Phnom Penh when U Sam Oeur had to pass by a dying, disemboweled relative to keep his immediate family safe; the prophetic dreams and the guiding spirits that kept him, his wife, and his son alive in a time when their country was filled with killing fields. His most personally unsparing account is of the period when Cambodia, freed by Vietnam, became a satellite of that country and he no longer had to feign ignorance to survive. Using poetry as protest, he spoke out against communism, lost his comfortable government position, and became a drunk, reciting his poetry in a rice wine shack. The amazing and often terrible odyssey of U Sam Oeur mirrors the history of Cambodia. His autobiography illuminates his country, revealing it in a way that it has never been shown before. Celebrated poet U Sam Oeur delivers a breathtaking and haunting portrait of Cambodia from his near-idyllic boyhood, to his years as a government official, to the devastating takeover of Pol Pot’s Khmer Rouge, and the subsequent "liberation" of Cambodia by the Vietnamese. Having been educated in the United States and a proponent of democracy, Oeur was forced to feign illiteracy in order to survive the killing fields and their aftermath. A witness personally touched by the three wildernesses — death by execution, death by disease, and death by starvation — Oeur emerged from the experience with his hope for peace, freedom, and the power of literature unshaken. This remarkable memoir is a testament to the horrors of genocide and the strength of the human spirit. 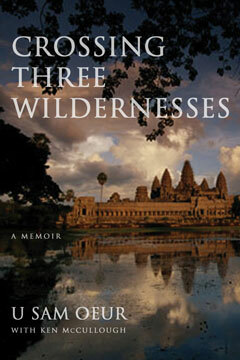 “Crossing Three Wildernesses” by U Sam Oeur is an amazing biography of a heroic, humane, and deeply honest man, whose life encompasses 70 years of Cambodia’s turbulent history. Whether he discusses his childhood in a farming village, his 1960s adventures at the University of Iowa, the horror of the Pol Pot years, the difficult aftermath when Cambodia was under Vietnamese control, or the spirit world that guarded and guided him with his family, he is always fair-minded and articulate, with the voice of the poet that he is. This is history that lives and breathes and provides a stunning example of one man whom we could all do well to emulate.